The book is essentially three projects in one. The first was a collection of oral histories from around the country. The second was the distillation of those oral histories into a narrative of three protagonists, each of whom led a sufficiently full life to merit a book in his or her own right and was thus researched and reported as such. The third was an examination of newspaper accounts and scholarly and literary works of the era and more recent analyses of the Migration to recount the motivations, circumstances, and perceptions of the Migration as it was in progress and to put the subjects' actions into historical context (540). Among various things, Wilkerson also discusses conducting interviews and driving across the country tracing her subjects' journeys. Based on her discussion of producing the book, what aspect of her research or processes did you find particularly important? Why? From the book what I found most interesting was that she was about to collect all these stories together and it smelled to flow. A common theme throughout this text was that despite the location there would always be difficulties an individual of a body of peoples need to face and overcome. With the migration of African American from the south to the North came with challenges and difficulties. Evan though she primarily spoke on times 1915 through the late 1970, not much has changed since those time and now. I found it interesting to see how she was able to tie in the stories and as well as, how well the book flowed. The oral stories of history from around the country was the most significant part of the book for me. It really set the tone of how the rest of the novel was going to go. With this novel, readers were able to get actual feelings and opinions about the history of segregation, discrimination, and the migration from people who went through it. Any experience told from the actual time makes you relate more and understand why things may be the way they are now. The past definitely affects the present and the past does have a tendency to repeat itself at times, just in a different form. Wilkerson did a great job in transitioning from the characters' perspectives to her own. This has probably been one of my favorite books in my years of being a Haley Scholar. I thought it was meaningful that Wilkerson wrote mostly about an overall migration. She sought to answer questions focusing on the demographics, politics, economics, and sociology of other people's migrations but in reality to obtain that information, she had to endure a migration of her own. She named many areas that she traveled to throughout this journey and by coming into contact with these people and going on a journey her self, she was able to really find the meaning behind migration and the type of obstacles her interviewees may have encountered, on a different scale. Also, I find it important that these migration stories were not just a series of events recalled but Wilkerson established important relationships with these people and that is admirable. The most interesting part of her research was the stories and how they were are so similar, and yet so different at the same time. Most of the stories had the same aspects but had different parts to them as well that made them unique. The author was able to gather all this information about different people with different backgrounds who share the same city or travels and make them flow and connect together. I found the oral stories of history to be the be the most important research for the book. Talking to the people that were living during the great migration time period made that part of history more real to me. It it true that now a days, a person can just go online and google information about moving fro the south to the north, but actually being able to talk to people who were living through that experience and getting there thoughts on how it was to move to the north makes the stories much more interesting. I thought it was very important that she actually took the time out to physically go out and search for her subjects, driving across the country to trace their journeys. I think this gave her a ton of credibility because she was able to witness and re-create what her subjects had been through. The interviews were also essential as she was able to get information from mouths and have face-to-face interactions rather than books or anything else. I think Wilkerson did a great job tying the 3 projects into one and making a very profound book. I thought that an important aspect of the research was the collection of oral stories and also the examination of newspapers and literature from that time and from today. By doing this readers are able to get a better understanding of what people went through during the Great Migration. The novel also shows how the events of that time still influence the world we live in today. The experiences told in this book were very interesting to read. I found it important that the author took so much time to conduct all of the interviews and compile stories of each person's firsthand experiences. The way that she incorporated them along with historic information from the different periods in time made the book so much more captivating and enjoyable to read. Without the personal anecdotes told in the book, it would have just been like any other history book, which often times leaves you with more questions than answers about how things really were; the stories make you feel as though you could've been there. Wilkerson went further in her research than I think most people are willing to go. I thought it was really important that Wilkerson traveled the same path as Dr. Foster, to really try to get a sense of how things happened back in 1953 (pg.541). I also think Wilkerson’s upbringing was very important to her research, the little snippets of what truly happened that she was able to gather from her parents and the immigration she was able to see during her time in grade school, definitely made an significant impression on Ms. Wilkerson. I think oral stories were the most significant for me. Oral stories add a sense of family and culture, to whatever medium. Getting information from a person's own mouth, that has been and seen the events you are learning about, is important. It set the tone of the book where I was reading as if from the yes, of all the black families moving up north. I mean, not everyone's story is the same, but getting just a fraction of that, is inspiring. It really made me appreciate the hardships that people went through back then. I'm glad this book was chosen as a reading for this scholarship. I can't wait to read a new one, coming to use next fall. I think what was particularly important was that the author collected everyone’s story and compiled it into a book that showed what each individual went through. I though it was important to show that many people had struggles during the migration. Each person had a story to tell and they were all connected in some way. I think the oral histories was the most important. People can read facts in a history book, but when you get to hear about events through someone's personal experience, it takes it to a new level. Personal stories are the most touching and you get more detail out of them. Also, personal stories are the closest we can ever get to walking in someone else's shoes. Everyone has different experiences and getting some insight into those well help people grow themselves. The beautiful thing about this book is the journey of it all together. It plays out the author's journey as well as the participants. Everyone in this book had challenges to overcome in life. That is life. It is all about prevailing the challenges you have. This novel conveys this message beautifully. I was particularly drawn to the narrative aspect of this work. For some, history can be boring and hard to connect with, but this author took the time to take the facts and make the information relational. It was an amazing feat to take a lot of information and condense it down without dumbing it down and Wilkerson accomplished an amazing piece of art. I was impressed and grateful that we read it. Thank you for introducing the Haley scholars to this text. It is a valuable piece of work. I think one of the most interesting parts of the research were the oral history of the Great Migration. I think those were very interesting because those who migrated lives changed drastically. Many were sharecroppers moving into big overpopulated cities. It was also interesting to hear the stories about how the community changed over time. Crime became prevalent in the black community and there were no law officials to deter crime or even enforce the law. The most important aspect for me are the individual cases. It's easy to spout out a bunch of facts about what happened in each of these cases but to see real people and families go through these struggles makes it all the more real and relate-able. In collecting the oral stories, she must have been thorough in turning over every stone plausible. This would provide her with the plethora of topics , views, and experiences she would need to form the beautiful thought-provoking piece we have been reading. Without the personal stories, the way they make the reader connect to the novel, is more important than any facts or statistics. The personal experience will forever be the one that grabs a hold on a reader's heart, pauses their breathing momentarily, and leaves them wanting more. To me, the most important process was gathering the information. She traveled around and collected information which she then expressed through various protagonists. This made it easier to understand the material. This also made it easier for me to get lost in each protagnists histories so that I could imagine myself in their place. I thought that was important because being able to put myself in their shoes helped me emphasize better than just reading facts. The most compelling entity regarding the production of the novel was the collection of oral histories from around the world. This journey abroad must have been truly insightful, interesting, and the foundation during her writing of the novel. The process that I found most important was the authenticity of the stories. She actually spoke with a great deal of people who were involved in the Great Migration and it gave the book a more narrative feel, as opposed to other texts that deal with historical events. In addition, the chronological story-telling aspect allowed me, as a reader,to be more interested in what would happen next. I thought the oral stories of history were an important contribution for the book. It is a great method and source to be able to talk to people who experienced the great migration; it made it more realistic and accurate.One other aspect that I liked was that she seemed to be able to make it all flow into one story that meshed really well. One key topic throughout her oral stories was that many people are different, but there will always be difficulties throughout life and those oral stories confirmed that. I think all the different stories was one of the most important aspects of the book. Giving actual stories of different places and events really helped me understand what really happened during this point in history. It also made the read more interesting and made me actually feel for the individuals telling the stories. I thought that the most impressive facet of the research conducted Wilkerson was the gathering of first person accounts of the major moments in black history in America. These oral narratives helped to bring the history to life. Through this perspective recounts of history become intimate and we as readers are able to easily recognize that we aren't so much different from those that came before us. I think that the oral stories were the most important part for her to collect. These stories tell a true account of the emotions and feelings for the individuals in this time period. Stories told first-hand will have the most interesting details and things that are unique to that individual or group that would never be printed in a book or newspaper.The oral stories were my favorite part of reading this book and the words in those recounts still stick with me. I really enjoyed the collection of oral stories. There is so much to learn from the past and without proper documentation, oral reports are all that are left. All these people lived similar lives in terms of racism and discrimination, but they all lived their lives differently. It is interesting to see how each person was affected in their own way. We have to learn from the past to avoid repeating such discriminatory acts in the future. I thought it was important that Wilkerson took as much time as she did with all of the interviews and compiled the stories of each person's firsthand experiences. The way that she incorporated them along with historic information from the different periods in time made the book so much more captivating and enjoyable to read. The way she narrated each person's stories really made you feel like you were there. I found it important that she took the time to hear stories from various individuals. Though they may have differed in some ways, that were all related in some manner. She took the individual stories and converted it into one. That is remarkable. The most important part of her research were the oral interviews and all the time she put into locating people for these interviews. It's nice to have background research and facts supported by newspapers and the like, but there is something much more powerful about hearing something, or reading, from someone's own words. To hear how they felt during that time and what they were going through makes one appreciate it that much more. I feel that the oral interviews were the most important part of her research. It's one thing to sit and read a history book about the Great Migration, but it's another to read or even hear someone's own personal retelling of what happened. Each story is unique in that it shows just how differently a single event affects individual people. History books are great in that they give us a general overview of what happened, but personal accounts such as the ones in this book help us understand even more just how it impacted the people involved. I think Wilkerson was dedicated to her research because she felt directly connected to the Great Migration seeing as though her parents were involved. I think that because she was so dedicated, she went above an beyond to find deeper understanding of what happened in those times. 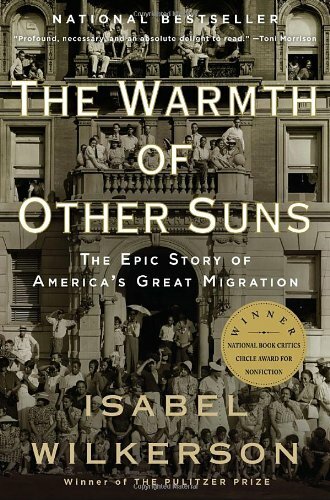 I think that this book greatly illustrates what happened during the Great Migration and that this a great tool to use for those looking for a vivid and better understanding of this devastating time period. I thought the most important part of her research was obtaining oral accounts and listening to interviews of the stories that people had to share. Also, going on the journey herself, and traveling to all of those different places she mentioned in order to see what they had to go through to get there were very important. All of these aspects of her research were important because not only was she able to put herself somewhat in their position, she was able to see the improvement of her own life from what they had to endure, and how far we have come from the past to the present. You can't understand what someone went through unless they tell you themselves, and you hear it from them, or unless you put yourself in their position and endure it yourself. The most important part of her research would have to be the oral stories. The oral stories is primary source that gives an account like no other. History or any accounts are usually written by whites who can't give no actual accounts. But by having the oral stories it adds another layer to history. It adds tension to the usual narrative that we are use to hearing in regards to the black experience. The aspects that I found important was actually speaking to the people who lived through it. That was the most important part to me. It gives you an account on the struggles they had to endure to get to where they are today. 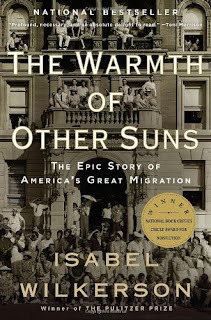 Until I read this book I had no idea what went on during the great migration. Some of the stories I found myself in shock at the things that were allowed to go on. The best way to hear about something is to hear it from a person who has experienced it and lived it. These oral stories are ones that you won't find in a history book, and it gives you glimpse into how it felt to be an African American at this time. I think the most important part of her research was the oral stories from the various people. Most historical texts don't tell what the people actually experienced which makes this so interesting to read. The stories were similar but so different which made reading this very enjoyable. I really enjoyed that she used the oral stories as an important focus of her book, but I think the most important part of her research was that she used the newspaper and other documents to put the story into a historical context. I could see someone who isn't familiar with black history or the adversity look at the book and reject the truth due to the fact that it only featured oral stories. Someone from my hometown for instance would refuse to admit that it hold any historical truth if it were told from the perspectives of only a few people. But I'm glad that she made a historical context for the book because it makes it much more real for any reader. I liked knowing how much work she put into the book as well. I think the fact the Miss Wilkerson was actually able to see some of these things first or second hand was a great influence on her ability to write this book. I also really admire her dedication to her craft, such that she actually went to revisit some of these areas to experience the aftermath and the changes present because of this migration. Overall, I think it probably gave her a level of understanding and appreciation that even she wasn't expecting. I think the most important aspect of her research was her dedication and thoroughness. She did not simply gain the accounts of different individuals. She traveled, researched, learned, and then analyzed all the information she had attained and pieced it together to form this novel. The stories within this book are monumental in themselves, but the way Isabel Wilkerson presented these them makes it a powerful piece. I think the most important parts of her research was discovering the stories and making them go together. People can look at newspaper clippings and books but the part of the book that personalizes the expierence and connects to the reader are the personal stories of real people told from their own perspective. I think the most important parts of her research was retracing the steps of the people she interviewed. By doing this, she was able to look at public records and most likely interact with some people that knew the subjects she was interviewing. Also, her dedication to this was very important. She had to commit a lot of time to doing research with these families, and this yielded a very personal book that informs the public on real lives of the great migration and how it influenced history. To me, the most important part of her research was actual interviews from people who went through and witnessed what was going on first hand. This is because we can see what happened from their point of view instead of the potentially biased points of view of the newpapers or other literature. Many of the literature about the subject, specifically those written by whites might be too embarrassed or apologetic abut the topic to fully disclose the specifics of what was happening. Many textbooks today do not even come close to addressing the topics and concerns addressed in this book. The most important part of Wilkerson's research has to be the oral stories that she collected alongside with her dedication to reenact their travels. By performing reenactments of their journeys, she was able to personalize each story to a new degree by living it, turning their words into personal experiences, and it shows in her writing style. The most important and interesting aspect to me was that she went out of her way to go get everyone's stories. This shows that she really had a deep passion to not only get her story out there but also to try to convey it in the most correct way that she could. I think she accomplished this by doing so. I think the most important aspect of her research was getting in contact with the people who lived it. Going directly to the source, people who moved during the Great Migration, is the most sure fire way to get the truth and the answers she was looking for. When you make it more personal like that, you truly get to feel and embody their personal experiences to the highest potential without actually living it yourself. The most interesting part of her research to me was getting in touch with people who lived through these events. She got her information directly from the source, interviewing over 1200 former migrants to hear each individual story. I feel going directly to the people was the best way to get the most honest and realistic view of things. It was no longer a story but a collection of personal experiences. I believe the most important part of her research was her actually speaking to the people she used. Most people now just google people and leave it at what the internet said. This method made her research more authentic. I'm a little bit late with this blog post, due to some health issues. I really enjoyed this book so much, thank you guys for choosing such intelligent novels. I think the book was not only a story about emotion, but a story about education and history. It really helped, that the author had researched for her own novel, by contacting people who actually moved during the great depression. She went out of her way, to find the heart and soul of her novel, and it benefited greatly. I believe the incorporation of oral stories was extremely important to give the reader insight and an illustration on things that happened in the past to people from different yet similar walks of life. Learning from the past can prevent future mistakes. As a part of black culture the new age can soon forget the pain blood and tears of our ancestors that got us thus far and in order to make it through our current issues with society learning their struggles would be in our best interest. I found the authors collection or oral histories most important. I am a firm believer that people say what they mean and mean what they say. Words of the past are extremely powerful, and must be heard by the future.